Saliva is an American rock band formed in Memphis, Tennessee, in September 1996 and currently under Island Records. Saliva released their self-titled debut album on August 26, 1997, under Rocking Chair Records. They were signed to Island Records and went on to release their second studio album Every Six Seconds. Saliva later released their third studio album titled Back into Your System on November 12, 2002 which reached #19 on the Billboard 200. Back into Your System launched one of Saliva's most successful songs, "Always", reaching #51 on the Billboard Hot 100 and #1 on the Modern Rock Chart. Three years after Survival of the Sickest, Saliva released Blood Stained Love Story on January 23, 2007, repeating Back into Your System's chart performance at #19 on the Billboard 200. Its first single, "Ladies and Gentlemen", peaked at #2 on the Mainstream Rock Chart. Saliva was originally founded in Memphis, Tennessee in September 1996. After competing in the National Academy of Recording Arts & Sciences Grammy Showcase competition, where they advanced to the final round in New York City, the group self-released their self-titled debut album which sold over 10,000 copies in their region, prompting Island Records to take notice. Their Island debut Every Six Seconds was released in 2001, The album shows the band in their then nu metal sound. The album was their first to break them into mainstream popularity. It had two singles that performed well on rock radio, "Your Disease" and "Click Click Boom". "Back into Your System", their third album, was released in 2002, which included the chart topping hits "Always", and "Rest In Pieces" co-written by James Michael and Nikki Sixx of Mötley Crüe. The song "Pride" was first given to the fans in a concert in a small bar, but Josey Scott also took some heat during this era for shouting out vulgar remarks about the Dixie Chicks. The band toured in 2003, opening for KISS and Aerosmith. Saliva beat out Billy Idol for the tour. Saliva then released Survival of the Sickest on August 17, 2004, reaching #20 on the Billboard 200. On May 29, 2005, guitarist Chris Dabaldo announced he had left the band "for obvious reasons, as the band is not a unit anymore." He then shortly retracted his statement and apologized, declaring on the band's website that "there was a bit of an issue we're working through and we're looking forward to recording a new album later this year". However, the band's website later apologized again for the confusion and confirmed that due to "creative differences", D'ABaldo was in fact leaving the band, but that Saliva was "completely moving forward as planned and has our best music ahead of us". D'ABaldo eventually moved on to start the band Smolder. He is currently with Egypt Central. Jake Stutevoss formerly of the band Future Leaders of the World replaced him in Saliva's tour lineup. Stutevoss left the group right before the recording sessions for Ladies and Gentlemen. Jonathan Montoya, formerly of Full Devil Jacket, then became the next permanent member of Saliva. A new single, titled "Ladies and Gentlemen" was released in November 2006 to radio stations and made it to #2 on the US Mainstream Rock charts. Saliva released the album Blood Stained Love Story on January 23, 2007. It has also been included as the background music for a number of Sony's commercials for the PlayStation 3. The second single released off of the album was "Broken Sunday", which reached #8 on the Mainstream Rock chart, and is frequently on the Sirius top 20 on Octane. Saliva's tour manager Chris stated that the new single off Blood Stained Love Story would be "King of the Stereo". As of April 30, 2008, Octane 20 on Sirius Satellite Radio began playing a new song titled "Don't Question My Heart", featuring Brent Smith from Shinedown. The song can be found on the album WWE The Music, Vol. 8, and is the official television theme song for the ECW brand. Saliva's sixth studio album is titled Cinco Diablo and was released on December 16, 2008. The band have worked on a reality television show style DVD following the recording of Cinco Diablo and life on the road, in an interview with MJP, Josey was asked if it was a TV Show to which Josey stated "I hope not", and stated that he wanted it more as "a DVD or something for our fans". On 30 August 2010, the band announced the exit of guitarist Jonathan Montoya, saying that they would carry on as a four piece. They have begun recording their latest album, titled Under Your Skin, with Howard Benson. The band released the lead single from their new album Under Your Skin, entitled "Nothing". It was digitally released on February 1, 2011. "Badass" was later released as the second single, and reached #26 on Billboard's Mainstream Rock Tracks. At the end of 2011, after 15 years with the band, Josey Scott had decided to leave the band to pursue a solo Christian music career. 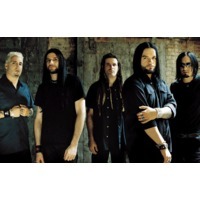 While initially unsure if the band would continue on, in early January 2012 it was announced that Bobby Amaru has joined Saliva as the new vocalist. According to Wayne, "he is a 28 year old singer, songwriter, producer from Jacksonville, Florida who has a GREAT voice and will not only bring some fresh blood into the band but; will also put a new spin on the Saliva sound." Amaru was the frontman of his solo band Amaru, as well as the drummer for Burn Season. on the 10th of February, Saliva released a brand new single named "All Around the World" and said that they will begin to write a brand new album straight after their upcoming tour.